The time complexity of linear search algorithm is O(n) where n is the number of elements in the target array, which shows its slower than binary search algorithm, whose time complexity was O(logN) because it was dividing the array into two part in every iteration. Actually the learning order is to first learn linear search and then the binary search but and we all learned that way but I found that when you first code binary search, then linear search becomes extremely easy and it also easier to reason about its time and space complexity and performance, hence I presented this algorithm after binary search. Btw, if you enjoy learning algorithms and want to see the application of algorithms in the real world but struggle with calculating time and space complexity, I would suggest going through Data Structures and Algorithms: Deep Dive Using Java, one of the comprehensive course on Data Structure and Algorithm on Udemy. This will not only teach you essential algorithms but fundamentals data structure like the array, linked list, hash table, binary tree, etc. Here is our program to implement a linear search in Java. It performs liner search in a given array. It first asks users to enter the size of the array and then each element. Once the array is filled, it asks the user for the target element. It then performs linear search and returns the index of the target element in the array, if it exists. If you want, you can also modify the algorithm to work on a pre-populated array, instead of asking the user to provide. The logic of linear search algorithm is encapsulated in the linearSearch(int input, int target) method, you can use as you wish. You need to just pass the integer array and target number and it will return you the index of the target element in the array. If you like to learn more about searching and sorting algorithm, I suggest you check out then Algorithms and Data Structures - Part 1 and 2, two great courses from Pluralsight. They are not completely free but you need to sign up for trial, which gives you 10 days free access to all courses in Pluralsight. 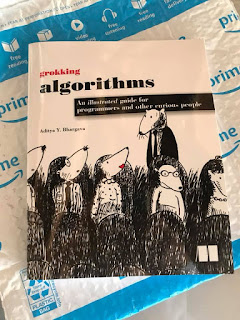 And, if you like books then you must check out the Grokking Algorithms by Aditya Bhargava, one of the most interesting book on algorithms with lots of easy to understand diagrams, visuals, and real-world explanation. I am reading this book now and it's truly interesting. You can see that our program has successfully able to find the index of the target element using Linear search or Sequential Search Algorithm in Java. If you are more curious you can also run this program with a large array, something which you can create programmatically. For example int numbers = new int[Integer.MAX_VALUE] will create a really large array and if you just put 1 in the last index and then search for it, your program will take a long time to respond because it has to go through 2^32-1 elements to reach the last element. That's all about how to implement linear search in Java. You can see that our algorithm is working correctly and it found out the right index for target value, 4 in the first case and 22 in the second case. It's one of the simplest searching algorithms but very important to learn and understand linked list data structure, which only supports linear search algorithm. Thanks for reading this article. If you like then please share with your friends and colleagues. If you have any questions or feedback, please drop a note. If you have any question or doubt then please let us know and I'll try to find an answer for you. As always suggestions, comments, innovative and better answers are most welcome.